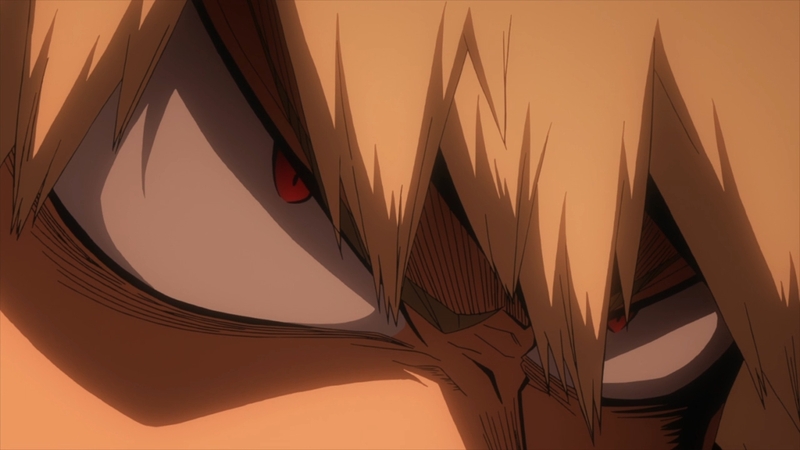 It’s a rare thing when I can call Bakugo one of the more rational characters in an episode of this show. I’ll fully admit to having serious issues with this guy and think his character has a lot of growth needed. But one thing I won’t say is that he isn’t dedicated to his goals. For all the issues he has there is one thing that is secure. His ideals and image of what he wants to become is crystal clear. His goal is to become like and surpass All Might. This isn’t an issue of power since if that was all he wanted then becoming a villain wouldn’t be an issue. Sure a major pull for Bakugo is how All Might always wins and is extremely powerful. But this is one strong result of All Might’s effort. 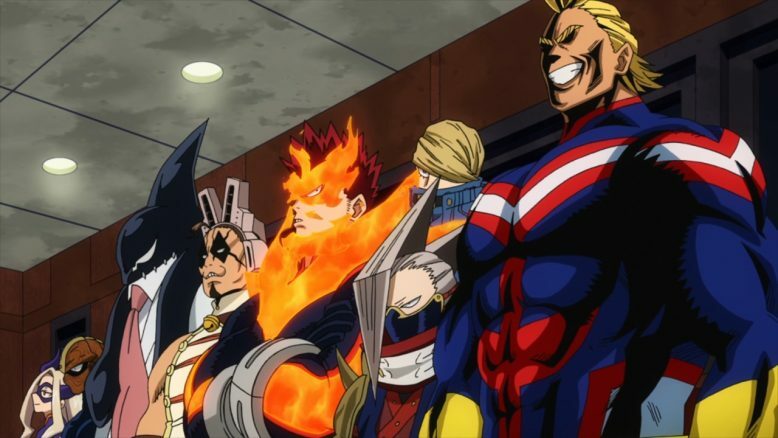 Individuals like Bakugo get pulled towards being heroes because of All Might. On the other hand you have Deku and company…I don’t think this is a situation the show can spin pulling All Might’s quote about heroes moving before thinking. This group has thought about this and they are still moving despite that. Iida was absolutely right to slug Deku here. The doctors have told this guy that his arms are in an ungodly dangerous situation. If he can’t get control over One for All soon he’s going to lose functioning arms! His mother has been worried sick. 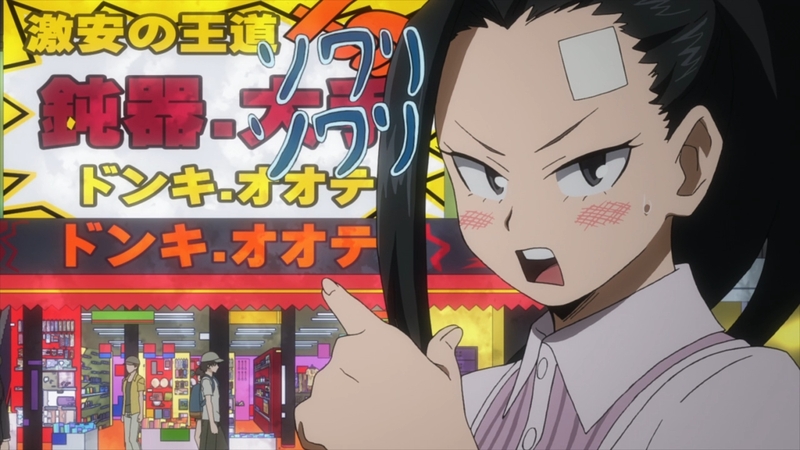 And what is his next course of action…go off to save Bakugo from the league of villains! Brilliant! I can’t help thinking this whole situation taking a direct shot at Naruto’s Sasuke Rescue Arc. This show isn’t holding back on showing how utterly terrible this idea is. Their big plan to avoid trouble is a covert rescue without using their quirks…that’s a terrible idea. This is a group with Deku, Kirishima, and Todoroki…none of these people are suited for covert activities or have talents in that field. So it’s a given that the main three of this rescue either aren’t thinking or are straight up lying about their intentions. I get how Deku feels. 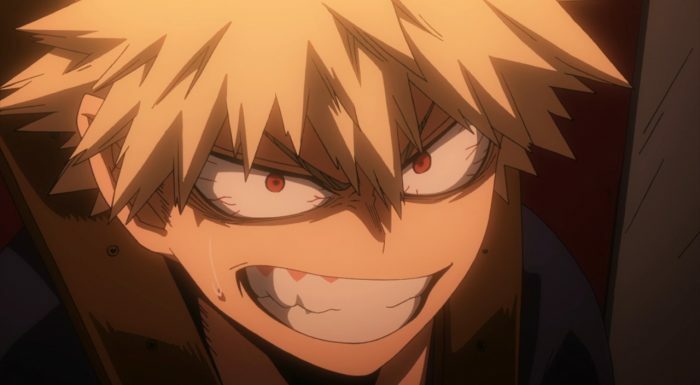 He was hit hard by failing to save Bakugo and Kirishima’s line riled his emotions. But this isn’t a case where he’s moving before thinking. He’s had time to think and is still doing something stupid. I feel for Iida who knows how they feel and can’t find a way to stop them. And I think Ochaco made one of the better points. Even in the best case scenario that these guys can ‘covert rescue’ Bakugo, it’s going to be humiliating for him. The last thing he wants is Deku’s hand stretching out to him. Now to be fair Bakugo has major character issues. 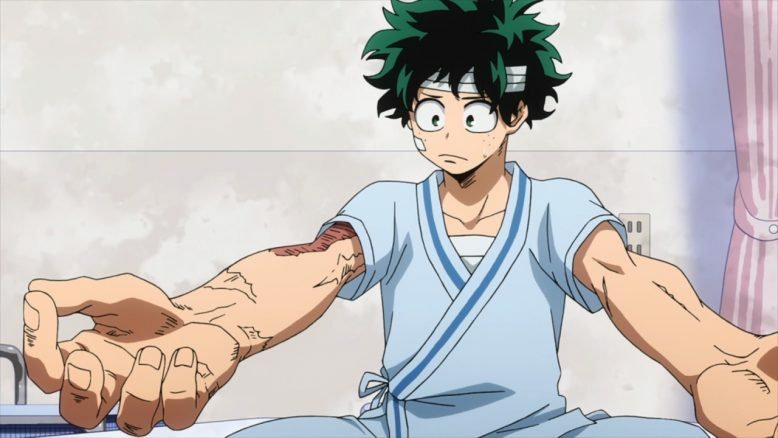 He needs to frankly get over his rage and also apologize to Deku for years of bullying. But it’s clear cut that he isn’t going to want these guys saving him. He’s going to hate anyone saving him at this point. But I think he can stomach it if All Might saves him. It may still piss him off, but he can probably deal with that. But Deku and his classmates are a non-starter. 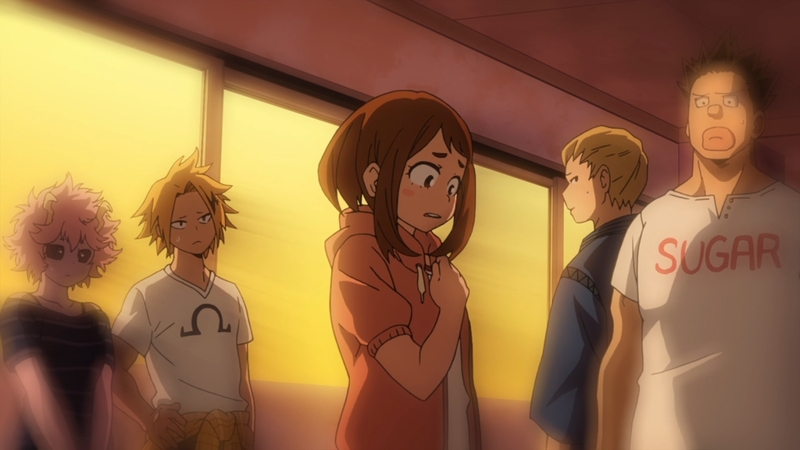 That’s probably the wrong stance to have, but that doesn’t mean Ochaco isn’t right. Frankly the only member of this rescue team that I think sort of has their head on straight is Momo. Although in reality I think she should have refused to help them. But she is a kind person who doesn’t want to step on their feelings. Now she’s still wrong to do this since if there is a moment of no return I’m not sure these guys are going to be shaken into not fighting. Her hope that they will realize how stupid their actions are is hoping for quite a bit. But I get that she wants to respect their hopes while also preventing them from going too far. Up to a certain point she can destroy the device and refuse to make another one for them. And while the students are being stupid, the pros are prepping for action. Sure UA is taking a public beating, but that’s society for you. People are quick to blame and less quick to be understanding. Results matter and the pros are gathering to get those results. They know where to find Bakugo and they aren’t messing around. This isn’t a random bunch of teachers. They’ve got a ton of top 10 heroes coming in. Sure I hate Endeavor and think he should be in jail for beating his family, but at least he’s useful in this sort of situation. The League of Villains kicked a hornet’s nest. They might not be happy that they did. This was a pretty good episode. For all the things I dislike about Bakugo, his actions here are ones I do approve of. I’d rather he had ‘helping people’ as a motivation, but he is someone that can’t be converted. He is a pain to deal with, but he’s not someone villains can lure either. His vision is clear. All Might is his ideal. That isn’t something he can surpass if he leaves the path of becoming a hero. He has to be a hero to reach his goal. Bakugo has villainous qualities to him at times. But there is a difference from having major character flaws and being a villain.